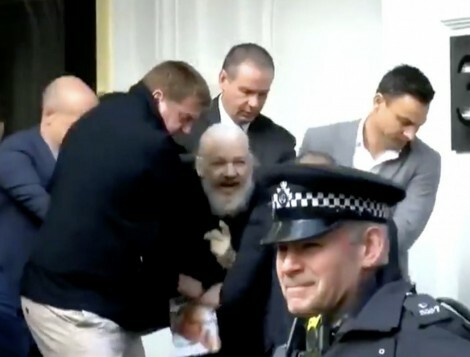 The shocking arrest of Assange carries a warning for all who, as Oscar Wilde wrote, "sow the seeds of discontent [without which] there would be no advance towards civilisation". The warning is explicit towards journalists. What happened to the founder and editor of WikiLeaks can happen to you on a newspaper, you in a TV studio, you on radio, you running a podcast. Assange's principal media tormentor, the Guardian, a collaborator with the secret state, displayed its nervousness this week with an editorial that scaled new weasel heights. The Guardian has exploited the work of Assange and WikiLeaks in what its previous editor called "the greatest scoop of the last 30 years". The paper creamed off WikiLeaks' revelations and claimed the accolades and riches that came with them. With not a penny going to Julian Assange or to WikiLeaks, a hyped Guardian book led to a lucrative Hollywood movie. 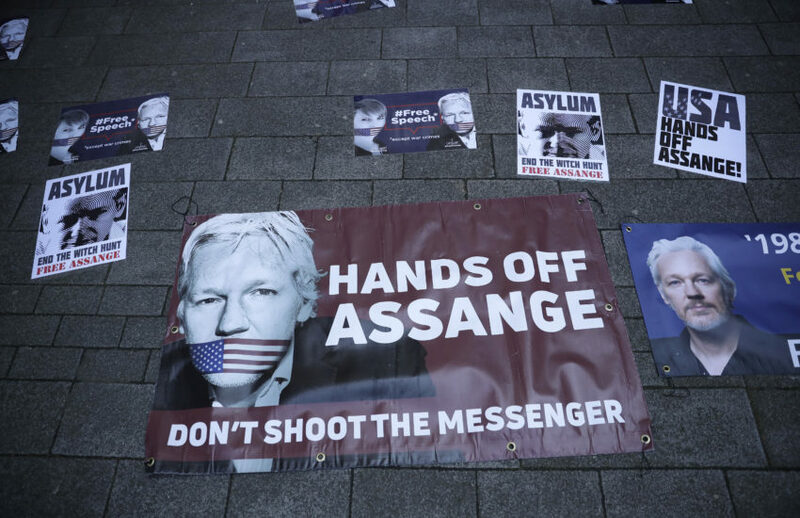 The book's authors, Luke Harding and David Leigh, turned on their source, abused him and disclosed the secret password Assange had given the paper in confidence, which was designed to protect a digital file containing leaked US embassy cables. With Assange now trapped in the Ecuadorean embassy, Harding joined the police outside and gloated on his blog that "Scotland Yard may get the last laugh". The Guardian has since published a series of falsehoods about Assange, not least a discredited claim that a group of Russians and Trump's man, Paul Manafort, had visited Assange in the embassy. The meetings never happened; it was fake. But the tone has now changed. "The Assange case is a morally tangled web," the paper opined. "He (Assange) believes in publishing things that should not be published.... But he has always shone a light on things that should never have been hidden." These "things" are the truth about the homicidal way America conducts its colonial wars, the lies of the British Foreign Office in its denial of rights to vulnerable people, such as the Chagos Islanders, the expose of Hillary Clinton as a backer and beneficiary of jihadism in the Middle East, the detailed description of American ambassadors of how the governments in Syria and Venezuela might be overthrown, and much more. It all available on the WikiLeaks site. If Assange is extradited to America for publishing what the Guardian calls truthful "things", what is to stop the current editor, Katherine Viner, following him, or the previous editor, Alan Rusbridger, or the prolific propagandist Luke Harding? David McCraw, lead lawyer of the New York Times, wrote: "I think the prosecution [of Assange] would be a very, very bad precedent for publishers... from everything I know, he's sort of in a classic publisher's position and the law would have a very hard time distinguishing between the New York Times and WilLeaks." Even if journalists who published WikiLeaks' leaks are not summoned by an American grand jury, the intimidation of Julian Assange and Chelsea Manning will be enough. Real journalism is being criminalised by thugs in plain sight. Dissent has become an indulgence. In Australia, the current America-besotted government is prosecuting two whistle-blowers who revealed that Canberra's spooks bugged the cabinet meetings of the new government of East Timor for the express purpose of cheating the tiny, impoverished nation out of its proper share of the oil and gas resources in the Timor Sea. Their trial will be held in secret. The Australian prime minister, Scott Morrison, is infamous for his part in setting up concentration camps for refugees on the Pacific islands of Nauru and Manus, where children self harm and suicide. In 2014, Morrison proposed mass detention camps for 30,000 people. Real journalism is the enemy of these disgraces. A decade ago, the Ministry of Defence in London produced a secret document which described the "principal threats" to public order as threefold: terrorists, Russian spies and investigative journalists. The latter was designated the major threat. The document was duly leaked to WikiLeaks, which published it. "We had no choice," Assange told me. "It's very simple. People have a right to know and a right to question and challenge power. That's true democracy." What if Assange and Manning and others in their wake - if there are others - are silenced and "the right to know and question and challenge" is taken away? She told me that the message in her films, the propaganda, was dependent not on "orders from above" but on what she called the "submissive void" of the public. "Did this submissive void include the liberal, educated bourgeoisie?" I asked her. "Of course," she said, "especially the intelligentsia.... When people no longer ask serious questions, they are submissive and malleable. Anything can happen." The rest, she might have added, is history. The Trump administration will seek to try Assange on charges that he conspired with Manning in 2010 to steal the Iraq and Afghanistan war logsobtained by WikiLeaks. The half a million internal documents leaked by Manning from the Pentagon and the State Department, along with the 2007 video of U.S. helicopter pilots nonchalantly gunning down Iraqi civilians, including children, and two Reuters journalists, provided copious evidence of the hypocrisy, indiscriminate violence, and routine use of torture, lies, bribery and crude tactics of intimidation by the U.S. government in its foreign relations and wars in the Middle East. Assange and WikiLeaks allowed us to see the inner workings of empire—the most important role of a press—and for this they became empire’s prey. Is there any truth to the theory that Assange is just a phony outlet for planted intelligence agency "information" (disinformation)? That was the role of Lyndon LaRouche from the 1970's to the 1980's. It just seems improbable that Assange could have been living the exotic, one-of-a-kind, never-before-seen extreme lifestyle just based entirelyl on his own personal initiative. All of this Assange "circus" IMHO smacks of a stage-managed operation which had to have been employing resources beyond the means of this ostensibly penniless, homeless pathetic individual. In other words, have we been looking at, not Assange, but Assange, Incorporated?